Motion is a progressive change of position of a body. Velocity is the rate of motion, that is, the rate of change of position. When the velocity of a body is the same at every moment during which the motion takes place, the latter is called uniform motion. When the velocity is variable and constantly increasing, the rate at which it changes is called acceleration; that is, acceleration is the rate at which the velocity of a body changes in a unit of time, as the change in feet per second, in one second. When the motion is decreasing instead of increasing, it is called retarded motion, and the rate at which the motion is retarded is frequently called the deceleration. 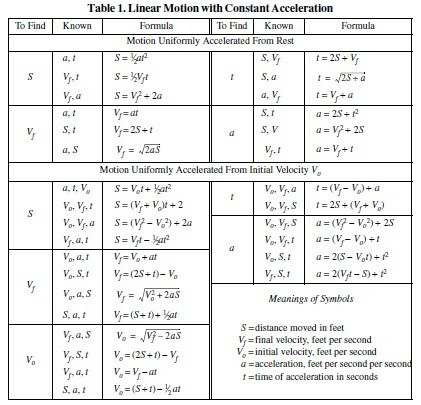 If the acceleration is uniform, the motion is called uniformly accelerated motion. An example of such motion is found in that of falling bodies. 1) Every body continues in its state of rest, or uniform motion in a straight line, except in so far as it may be compelled by force to change that state. 2) Change of motion is proportional to the force applied and takes place in the direction in which that force acts. 3) To every action there is always an equal reaction; or, the mutual actions of two bodies are always equal and oppositely directed. 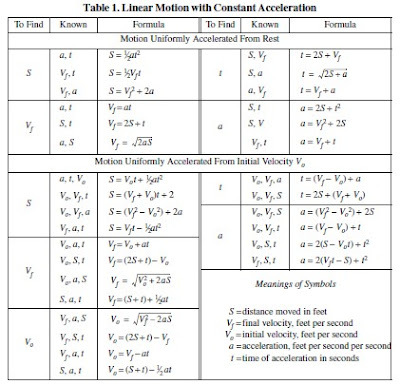 Motion with Constant Velocity.—In the formulas that follow, S = distance moved; V = velocity; t = time of motion, θ = angle of rotation, and ω = angular velocity; the usual units for these quantities are, respectively, feet, feet per second, seconds, radians, and radians per second. Any other consistent set of units may be employed. and Vo are opposite in direction.